Kim’s not the only person to make this argument. It happens a lot. It goes like this, usually: people who ride bikes don’t pay gas taxes or vehicle registration or tolls, so they shouldn’t get the luxuries of bike lanes or other forms of infrastructure that allow us to travel safely around cities. It would be a good argument if it weren’t wrong. Bicyclists already do pay for roads, many of which still aren’t designed with them in mind. It’s actually motor vehicle drivers utilizing public parking spots getting subsidized by everyone else. Most of the money for roads come from tolls and user fees, fuel taxes, license fees, and general taxes and bonds. It’s true that motor vehicle drivers (including those bicyclists who also own cars) pay the tolls, fuel, and license portion of that list. But as far as the United States as a whole is concerned, these three fees do not provide the bulk of funding. Nationally, those fees make up about 50 percent of all road funding, as noted by the Tax Foundation. The rest of the money comes from bonds and general taxes—which we all pay for, based on our income and what we buy. As noted in “Streetfight” by Seth Solomonow and former NYC transportation commissioner Jeanette Sadik-Khan, between 1947 and 2012, “American taxpayers as a whole paid $1 trillion more to sustain the road network than people who drive paid in gasoline taxes, tolls and other user fees.” And in 2012, $69 billion in highway spending came from Americans’ general tax revenue. 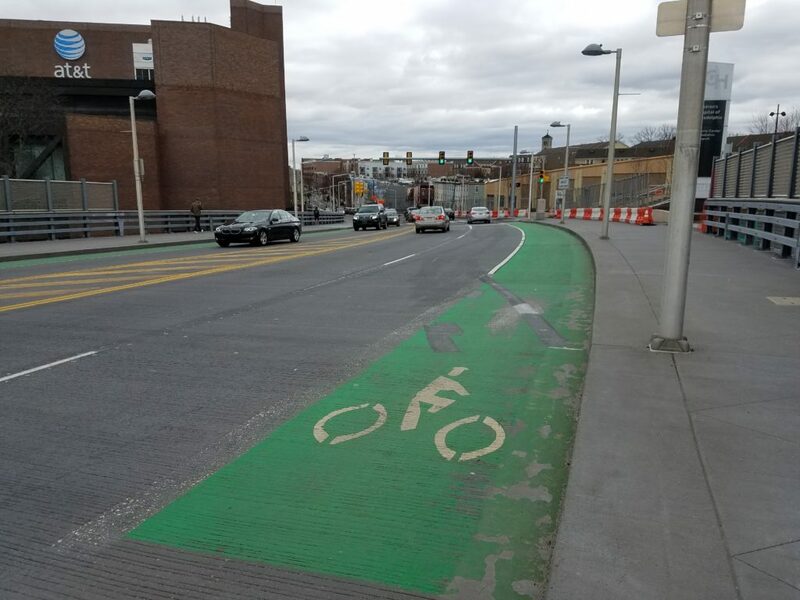 Such economic realities bear repeating when taking a look at city streets and bike lanes, many of which are faded, beaten up, and full of pot holes. Bicycles provide little, if any of this wear and tear. When bike lanes get beat up, it’s because motor vehicles are allowed to illegally park in them freely, with little-to-no consequence from enforcement entities. Long-term on-street parking additionally allows people to leave their motor vehicles on public space indefinitely for a mere $35 per year. Think about all the good that could be done with the free public space used by people’s car storage — or if people had to actually pay to store their cars. And that’s just part of it. Traffic deaths and injuries in Philadelphia cost the city about $1 billion per year, and $1 trillion nationwide. Looking at the cost of roads using the simplicity of gas taxes and other extra fees people who own cars have to pay to function in a car-centric society only tells about half the story. As it happens, people who own cars significantly underpay for the usage of their vehicles, the pollution they emit, the storage, their wear on pavement, and the destruction of public property they often cause. This is false. Even if bikes pay a portion of the road costs, it is lopsided when compared to the huge amount paid by drivers. So it seems bike people should thank drivers with a nice big hug every time they see one. Sadly, the opposite will occur. Also, you speak of parking, but do you pay to use the bike racks? No. And how much economic activity do cars bring to the city? Lots. Cars are necessary in the vast percentage of areas in the US. People also need to wear fancy clothes to work, buy large stuff, transport families, bad weather occurs, etc. Mass transit does not go everywhere at all times. Can’t always use a bike either. I have a compromise. Why don’t you advocate for members to get motorcycles or mopeds? You can then have the best of both worlds! Maybe you or Randy can clarify your points a little more, but why do you say this is false? Could you provide some more evidence to back that up? The post above says that the general public pays for 50% of all the costs towards maintaining roads, whether we travel by car or bike, so why is it lopsided? If a bike barely puts any wear on a road, then cyclists are paying an amount to maintain roads disproportionate to how much wear they put into them. If cars are putting most of the wear onto a road, in addition to being the priority users of them, shouldn’t people who don’t own or use cars very much pay a smaller share? -Bike racks: locking up a bike on a bike rack doesn’t impede anyone. I don’t think I’ve ever seen a bike rack block a sidewalk. Car parking takes up an entire lane of a road. Additionally, bike racks encourage people to visit businesses near them, so if anything, they might actually be good for a community’s economy. -Cars do bring economic activity to locations. That’s true, but that doesn’t mean we should look at our infrastructure from a cars-only viewpoint. -Cars are necessary in many places, but in dense urban areas, there are many other options available, including public transportation and cycling. -Not sure why a motorcycle or moped would be better for all cyclists besides then they’d be less likely to get yelled at by a motorist and they could use highways. They’re a lot more expensive to purchase, not as many people know how to ride them safely, and then there’s the benefits of riding a bike, such as getting exercise in and not emitting greenhouse gases. This is an absurd statement, you assume that bike riders aspire to own motorcycles or mopeds, and also that those who own bikes do not own cars. By following your logic, can we assume that since you own a car, you do not take public transportation, or own any other form of transportation? Bikes bring in quite a bit of economic activity, there are many rental bike stations around the city, which tourists can use to more easily get around the city, and visit more places than they would otherwise. Oh Mark, Mark, Mark. Amazing that for someone with your name, you are SOOO far *off* the mark it’s laughably sad. 1) You ONLY pay for street parking at Metered spots. NOT IN NON METERED SPOTS. So your argument is flat like tap water. 2) Cars do not bring economic activity. People do. If you put 100 cars with one person each into a city, versus two buses that carry 50 people each, you HAVE THE SAME ECONOMIC ACTIVITY. How? Well, not all those cars may be parking in *metered* spaces, or in garages. Many may have spots paid for by their company, or a lot for the company, or any # of things. Buses have a harder time with street parking and may have to pay to park in set spots. See, I already know how you think. 3) When the FACTS of actual numbers are given to you, WITH SOURCES, you call it false (really, you just want to use the term “fake news” but held off, congrats!). So your first point was refuted before you even put fingers to keyboard. 4) Do you pay to use bike racks? Yes, actually, in some garages. 5) Ok, now HERE you have valid reasons TO OWN A CAR/A BACKPACK/A SUITCASE/UMBRELLA/RAINCOAT/WINTER CLOTHING etc. The only part that REQUIRES a car is the “live where mass transit does not exist”. THAT We can all agree with you on. Oh wait, BUT this is about Philadelphia, not central NJ or PA. So we know that there are buses, as annoying as the routes and bus times are. But, Mark, again I DO AGREE WITH YOU that a car is FAR more convenient for driving in wet/cold/hot weather, for having to do shopping where you will get many things, AND cars are FAR more comfortable than a bicycle. Yes, I agree with you on that. But, none of those things have anything to do with putting in a protected bicycle lane or funding trails. None of the positive car reasons have anything to do with the fact that many many bicycle riders also have cars, also pay taxes, also…. well I can go on. By the way, I don’t drive in the South West part of Philadelphia, or the North, yet my tax money goes to pay for street upkeep there. And you know what? I DON’T COMPLAIN ABOUT IT!!! Car owners don’t come close to covering the price of maintaining the roads they use. Also, the more cheap on-street parking there is, the more congestion and traffic there is caused by cars circling around looking for parking. The more I read the more me first I see. Whatever happened to sharing and cooperation. When I and others bike we leave more room on the road for car drivers and most of us pull over when it’s safe if we’re holding up drivers. This is not about cars and bikes it’s about being respectful and sharing! Remember you only notice the cyclists and drivers who are misbehaving, not the ones who are respectfully and courteously following the rules of the road because we seamlessly blend in. Those naysayers responding to this article should look at the work of Sam Schwartz, former Transportation Director for NYC. He held that job during the aftermath of the 9/11 attack. His research shows that economic activity per acre in cities is maximized when robust multimodal transportation options exist (cars and buses and trains, AND bikes and walking). Car ownership per capital has been on the decline in America for the last 12 years. Additionally, for the first time in U.S. history, we are now an urban nation. More Americans live in cities than live in suburbs or out in the country. Furthermore, the generation of people now entering the workforce demand bike transit options in the places they want to call ‘home’. Failure to develop safe bike transit infrastructure could lead to a brain-drain, as this generation of workers leaves their local workforce, in search of cities where bike transit is more well developed. In Pottstown, work is finally progressing on completing that borough’s section of the Schuylkill River Trail. Some of the responses there sound similar to some of those here…”that money could have been used to replace the Keim Street bridge” (which has been closed for several years and will probably be for a few more). My rebuttal to that is twofold. (1) Read the blog article above. (2) Even I know the cost of that trail section is a small fraction of what it will cost everyone–us cyclists included–to replace that bridge.